This is the big barcoding page, where you can learn every aspect of tracking time with barcode scanners. Browse the topics below and click to view a video. 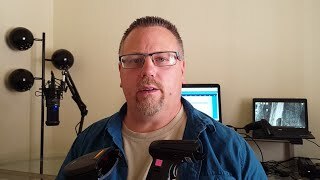 After you click, make sure to scroll down below each video for more details. This page is mostly important to manufacturers, assembly plants, and shops with employees performing tasks on items moving through the business. Each items is scanned, and the time is tracked. Learn the basics of collecting time and materials on the shop floor with barcodes. 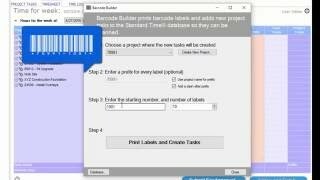 This tutorial shows how to print barcode labels with MS Word, how to match them to projects and tasks, and how to scan to collect time. 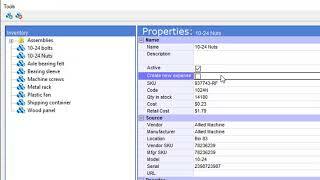 Learn how to collect materials and inventory items with barcodes on the shop floor. 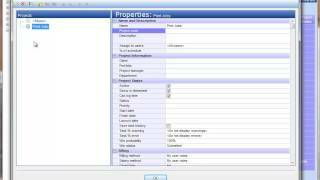 Scan expense templates, inventory items, and bill of materials (BOM's). These expense records can be added to employee time on invoices, reports, and manufacturing KPI's. Use this technique to scan the number of items produced during manufacturing. Learn how long each item takes to produce, which employee produces the most in the least amount of time, and get totals for production and invoicing. 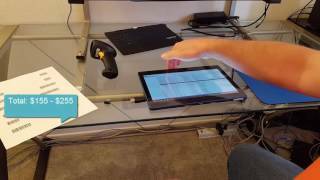 Use a Walmart tablet when scanning. Don't bother with full PC's or laptops. Skip the keyboard and mouse. Use touch-screen only with barcode scanners. This simplifies and reduces cost. Employees can see a percentage gauge when scanning tasks. This acts as a psychological incentive to complete tasks quickly. 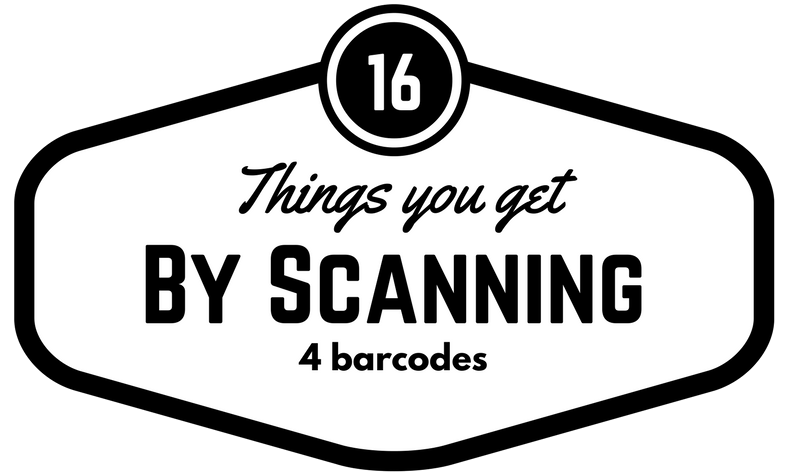 Here's a quick list of 16 things you get by scanning barcodes on the shop floor. Plus, you can invent a lot more. These are just the basics. 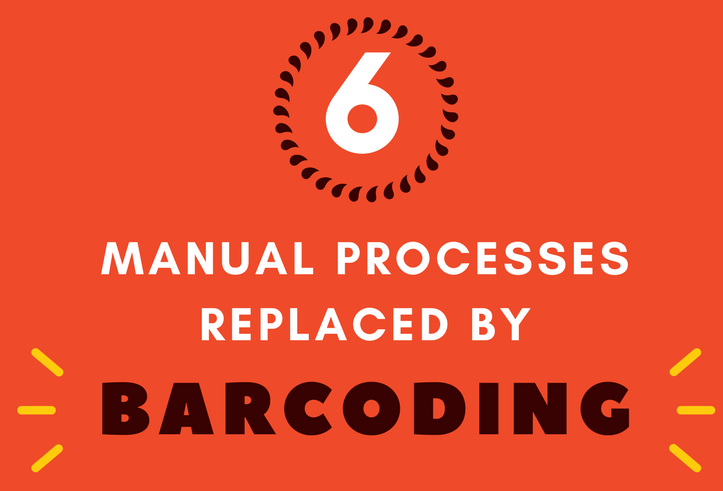 Convert your shop over to barcode scanning and you'll save manual labor, you'll communicate more efficiently, and you'll get more accurate data. 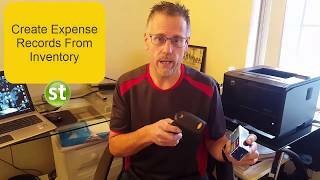 Get a feel for how barcode scanning can improve your shop floor experience and profitability. 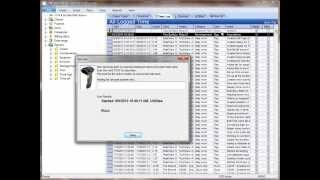 Automatically reorder inventory items when scanning with barcodes. 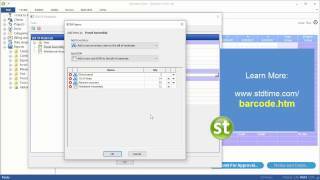 Collect materials and expenses on the shop floor, and automatically deduct inventory and BOM's from stock. This is the starting point. 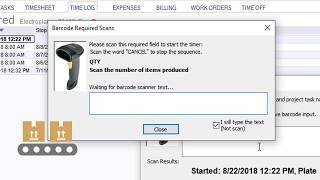 Here, you'll learn the very basic scanning techniques to start a timer using a barcode scanner. Employee hours will show up in the timesheet, where you can report and analyze. With these simple techniques, you are now collecting time for each employee, time for each project, and each category. That is information you can use to improve your business, and find out how long things really take. How to get started: Go to amazon.com and buy a $20 scanner. Plug it into your USB port, open Standard Time®, press the F4 key, and scan your first barcode label. That's not hard! 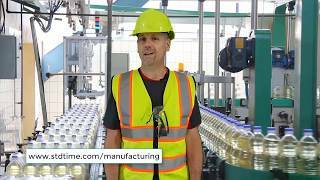 Take barcoding and time tracking just a little farther in this video. Scan projects, categories, and project tasks. 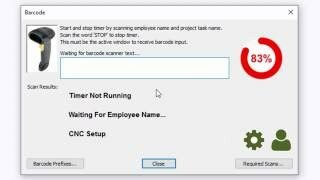 See how each scan creates a new time log that is timestamped and tagged with the employee, and all the information they scanned. Think about how this new information could affect your business. What could you do with it? Could you improve processes? Eliminate processes entirely? Consolidate? 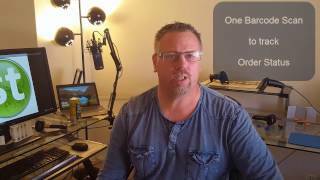 By the time you finish this video, you will have some inspiration to try new things. If tracking time is this easy, you will commit to doing it every day, all day long. 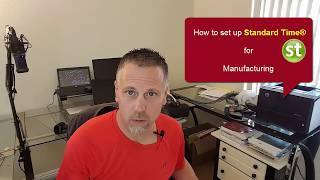 Got a larger manufacturing shop? Or a sea of operators that all need to scan tasks? Then you probably need to connect multiple barcode scanners to a single PC. Multiple scanners on a single PC requires that you program a "prefix" into each scanner so the program knows which one is scanning at any given time. Multiple scans will come into a single PC, and the software using prefixes to tell which is which. Just make sure that each operator has a direct line of sight to the computer so they know their scans are going into the computer and the timer has started. Sometimes you need to collect more time tracking information than just the user and project. For example, you may want to scan a machine name so you can find out how much time employees spent on that machine. Or how much time they spent using certain tools or other shared resources. 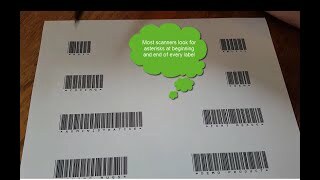 The method shown in this video opens your barcode scanning to a completely new level. You can collect any information you desire. And once you collect it, you can report and analyze it. Examples: How much time was spent in building 12? How much time on the "green" machine? Or how much time on assembly line number 14? You'll find out pretty quickly! Need an inexpensive station for barcoding on the shop floor. 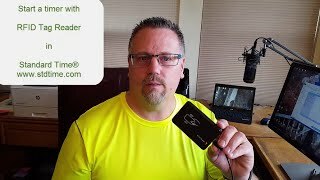 Connect a wired scanner to a Walmart Nextbook and you're in business! In about 2 - 3 hours, you'll be collecting real time tracking info. Sure, the Nextbook is not ruggedized, but you could protect and mount it in ways that make it work. And if you like the results, upgrade to other options at a later time. 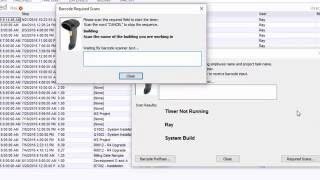 Learn how to display a Percent Complete gauge when tracking barcode time. A gauge like this motivates employees to finish up tasks and move on. When employees see that tasks are nearing completion, they natually speed up and get things done. When they see the color red, they know something is critical. The psychological effects are enormous. The simplest way to print barcode labels is MS Word (or any other word processor). Just enter some text, select it, and choose the barcode font. Now print it out. But what font should I use for barcode labels? Click the link, and then scroll down below the video for a link to download the font. Once installed, you can use it in any program. MS Word is just one possibility. You'll soon see that the barcode font can be used by the timesheet itself to print barcode labels. If you already have a project and some tasks you want to scan, you should consider using a special reoport that prints barcode labels for them. There is a report that lets you choose a project, and it will print all the barcode labels for the tasks under it. If the list is short, you can laminate that page and use it to start tracking time right away. The report also prints the words STOP and CLEAR at the bottom as a convenience. Barcode Builder™ is the big leagues. 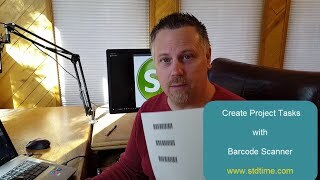 This is where you print dozens or even hundreds of barcode labels, plus create project tasks for each one. Actually, you don't need to be a big operation to use this. It's just a simpler way of printing lots of labels on Avery™ 5160 templates™. Those templates contain 30 sticky labels. You choose the starting number and the quantity. Out comes sheets of sticky labels with the barcodes printed on them. Now that you have labels, you can stick them on anything and start scanning time. 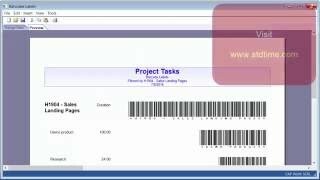 If you already have barcode labels printed somewhere else, you can scan them to create project tasks. Project tasks are used to compare estimates to actuals. Give each task an estimate for how long you think it will take. Actual hours will come in from employee scans. Now you know the percent complete, and can compare your original estimates with the actual hours in the timesheet. There are many ways to print barcode labels for time tracking. This page shows several ways, with video tutorials for each one. You could print labels with MS Word. Or, you could use a special report to print them. Another possibility is with Barcode Builder. Browse the list and pick one that works for you. Need to track more than just time? How about materials? 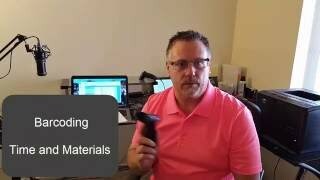 This video demonstrates scanning materials on the factory floor, and creating expense records to represent them. Now you're tracking time and materials with a barcode scanner. You'll see materials consumed in "real time" as employees use them. Subtract them from your inventory and you'll know when to order more. Scan one barcode label at each workstation or department, and you instantly have order status. When your customer calls, you know exactly where their order is. You know which employee touched it last. You know which department it is sitting in. You know what has been done to it so far. And you have a pretty good idea how much work is left to complete the order. You can answer customer calls quicker and more accurately. This page share several new ideas for tracking time in manufacturing. 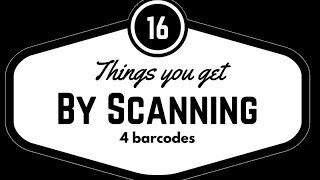 Barcode scanning is just one of them. It turns out, you can use RFID and mag card readers as well. RFID is a good choice for employee badges. You just pass your RFID tag near a proximity reader and a timer starts. Pass it by again, and the timer stops. That's about as simple as you can get. Mag card readers are just as simple to track employee time. Just like RFID, you swipe once to start and swipe again to stop.